Hey Chaddo been following you for some time with your blog. Wanted to day thank you for your google local shares. I was able to create a party company that is doing about half million dollar in sales a year. A lot of that marketing was from you or you inspired it and i ran with it and other ideas. For some reason it doesn't show friend request for me to add. If you can request it so i can follow you. All the best...Miami Mike! I've had a pretty good response from Google Maps Cash. It took a little time for me to get it running (I'm not very good with technology) but it got me on Page 1 of Google for several accounts. The best one was for a local retailer who had three stores in my home town. The owner was quite happy with what he said was a threefold influx of traffic in his stores and credited many sales to the incremental traffic. The account is an affiliate of mine that has 200 stores and an online store. 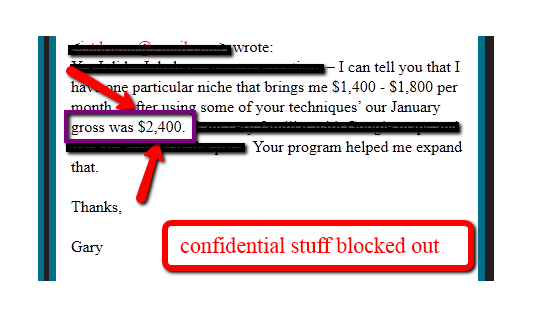 I've also tried it for another affiliate and was able to generate several thousand dollars so far in a grey hat situation. I have a ton of previous experience and the techniques that Chad gives can and do work. It is a bit overwhelming in that there is a lot of information and you could get a bit confused about where to start. My suggestion is give it time. 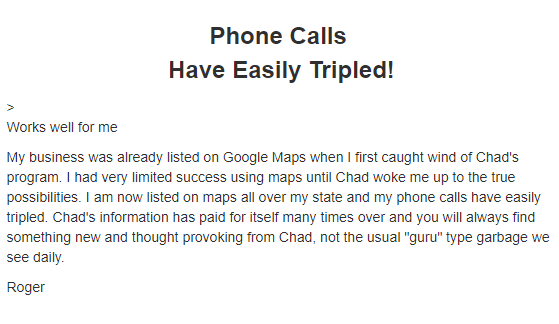 (implement one technique a month until you master it) I think Google Maps Cash does deliver on it's promises and if it is used regularly can 100% improve your business. 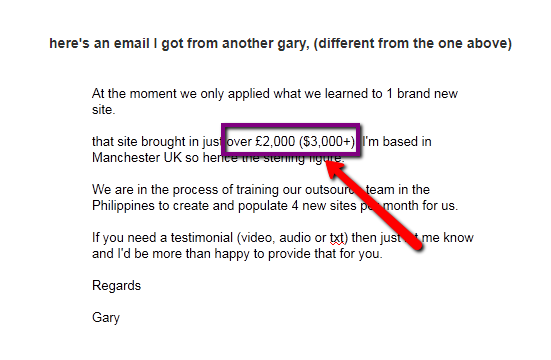 Just one affiliate site I own went from an average of $1,200 per month to over $2,400. The key here is product. So don't judge on $, judge on traffic. You must implement the entire program and that can be exhausting if you are not up to it. 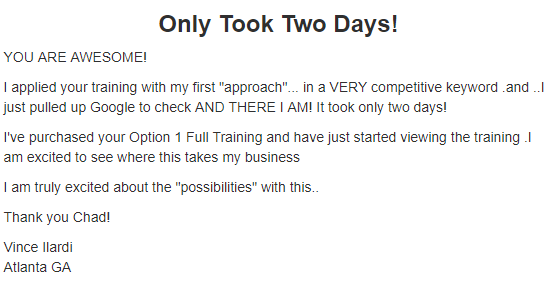 But being someone who is highly involved in internet marketing and approaches it as a business (not a pastime or hobby) You get out of it what you put in and I would bet most people are passive and want instant results. I've been using your system now for a couple of months. Your Google maps information is not only very informative but also dead on! With-in a few days of me creating his "new" business listing, Google merged the two ( as you predicted might happen) with the local business listing that had previously been in existence set up by the corp. home office or Google,not sure which. Wow did I about have a cow right then and there. Fortunately Google rewarded me the new listing, I'm guessing because I had totally fleshed it out as per your instructions and it appeared to be the most relevant of the two. 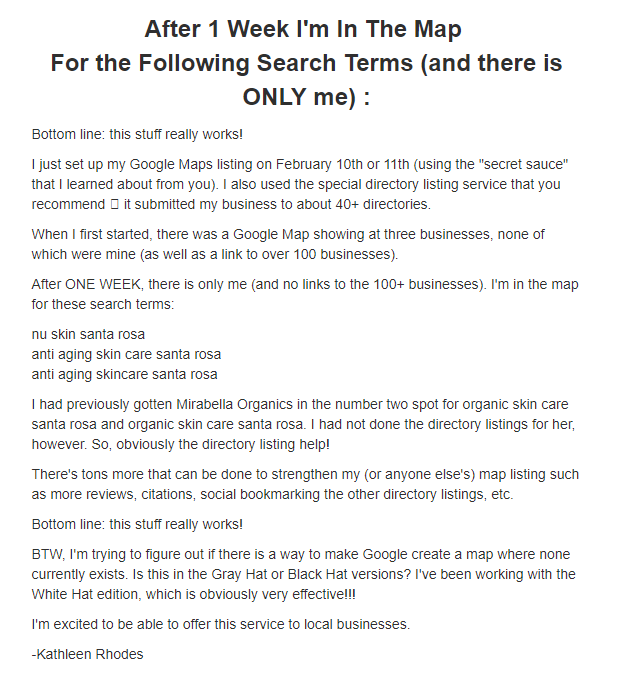 Since then, approximately two months later, not only did the new Maps listing become prominent , but we have managed to take over- "Dominate" the first two pages of the natural search results for 7 different keyword phrases locally in his city. Imagine not having a competing company show up for two pages. Just for those of you who might still be skeptical as to whether or not you can earn money providing this as a "paid for" service to local business owners, I finish with telling you about how it has gone from a test pilot with one store to now doing Google maps local business listing for just shy of 500 different franchise owners of this company all over the United States. I can't find the words to express my gratitude enough to you both, Thank You! I own a few of Chad's products and I find that they all meet my criteria. The product must perform as advertised and the product must produce results. This product did exactly that for me. I don't believe that Chad promises that it will do a great job with absolutely no effort. I have been doing Internet marketing for a while now, and my results are always generally in proportion to the effort I put into promotion. If you're looking for a fast, simple way to get an incredible traffic flow with almost no effort, this is not the product for you. In addition, if that's your criteria, Internet marketing is going to disappoint you, no matter what products you buy. For a test case, I decided to market my product in the largest city in the US, New York City. There are 5 boroughs in New York City, and people do not usually travel to another borough to shop, so for maximum coverage I decided to market in each borough. I devoted an entire day per borough, following the steps in Chad's instructions. My experience has been that within 1 day of using the product in any location, I am #1 in the Google Maps box. In fact, in 3 of the boroughs in New York City, I am ahead of very large national chains. One unexpected bonus is that Google apparently assumes that distance covered matters in what it puts in a 10-box, not borough location, so in Queens I am number 1 in the 10-box and my Brooklyn listing is number 7 in the same Queens 10-box. 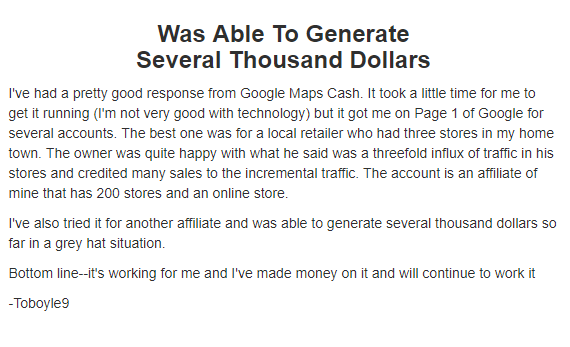 I have had similar results with other Google Maps promotions that I have done for my Internet marketing customers. Now a word about traffic. The whole purpose of Google Maps is to get you prominence on keywords that you would normally have zero hope of ranking for because you lack Page Rank and Authority. There is one other component to getting those viewers to click and come to you. The content of what you're posting. Being in the top 10 for heavy competition keywords is the crucial part of the Google Maps product and it does that very well. Traffic is dependent on what you say in that 10-box entry. How many people that are unhappy with the product had reviews added for the 10-box listing? I always do that and get the #1 slot in a day or two for BOTH broad and phrase matches. Do you check the OCI to make sure you're going after "buyer" keywords, rather than "looker" keywords? If you're number 1 in a "tire kicker" keyword, you're probably not going to get much traffic. By the way, I'm going to commit heresy here, but I really don't believe those Google numbers for search volume. There's a self-serving motive to having nice numbers. I compare Googles numbers to lottery pronouncements of how many people won over $1 million. Nice, but only good information if I win over $1 million. The only real traffic numbers that count are the ones I actually get, and I work hard to keep them as high as I can. Frankly, I have never been disappointed with a product that I bought from Chad. He spends a lot of time trying to find some really creative tweaks to help ranking and traffic counts, and I appreciate that. ​When I first downloaded the free google software and watched the basic videos... I was like wow... really simple stuff that doesn't take long to do... so I bought the google maps cash course for 250. I set out to get a listing for a highly competitive keyword in a 10Box that was full in a major city... new york city. The listing didn't happen right away and I got upset again and emailed Chad about it... his response didn't help me with the listing... however he did respond positively in another email in another direction. Do not link to any other website on your keyword optimized site, as the keyword of your links are non-relevant. who simply said "just got my first call, Thanks". 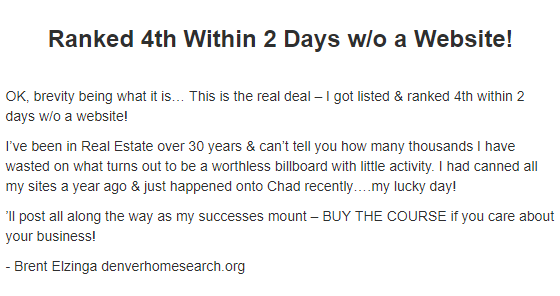 I quickly headed over to google and entered the phrase from Chad's software... Boom there she was #3 in the 10Box which previously was full... yeah Google booted someone off this 10Box to put this listing in.. because in Chad's words... "Google deems the listing as the most relevant to the the search term". Yes! I'm lazy and I don't like doing a lot of computer work... 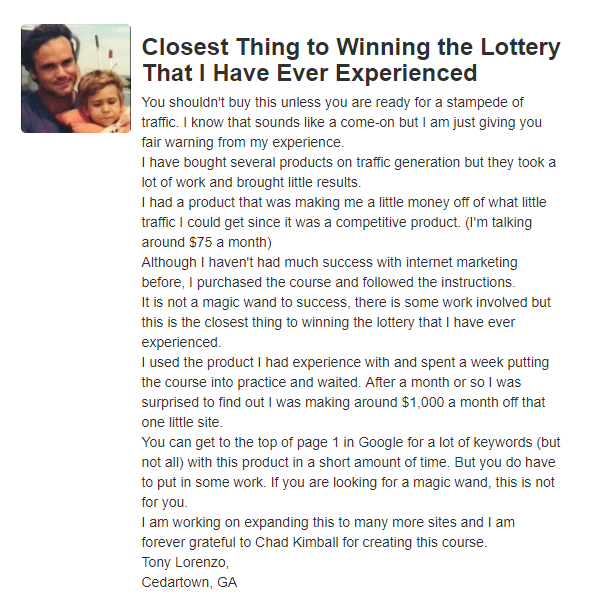 I used just one technique learned from Chad Kimball's Google Maps Cash Course... which works like Gang buster's... and ignored all the other stuff Chad said to do... and it works very, very well.